The Harvard basketball teams will look to hang the first Ivy League championship banners in newly renovated Lavietes Pavilion. 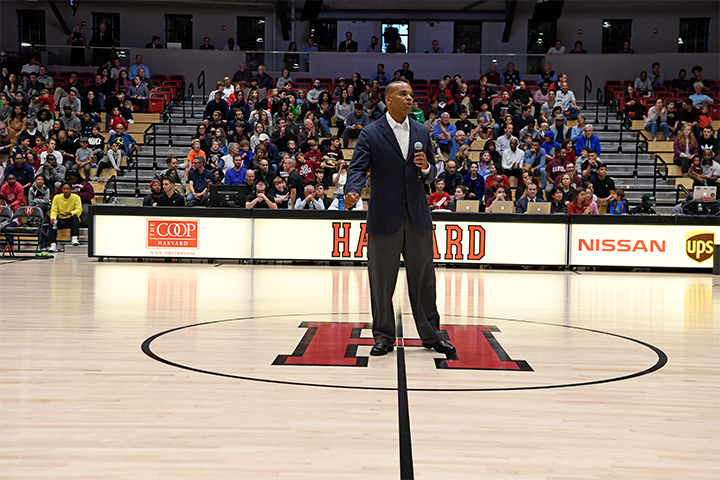 Coach Tommy Amaker (shown here addressing the crowd at Crimson Madness) hopes to lead the men's basketball team to its sixth Ivy League title. Head coach Kathy Delaney-Smith and point guard Katie Benzan '20, a first team All-Ivy selection last year, will look to lead the women's basketball team to its first Ivy League title since 2008. Last March, Lavietes Pavilion, the home of Harvard basketball, took on an unusual feel. Coaches in sports jackets gave way to construction workers in neon vests, whose boots marked the hardwood where sneakers usually squeaked. The tabletop machine used to operate the electronic scoreboard sat idly on the floor. The baskets were wheeled away amid the work—begun the previous summer and mostly paused during the 2016-2017 season—to gut the 91-year-old building. 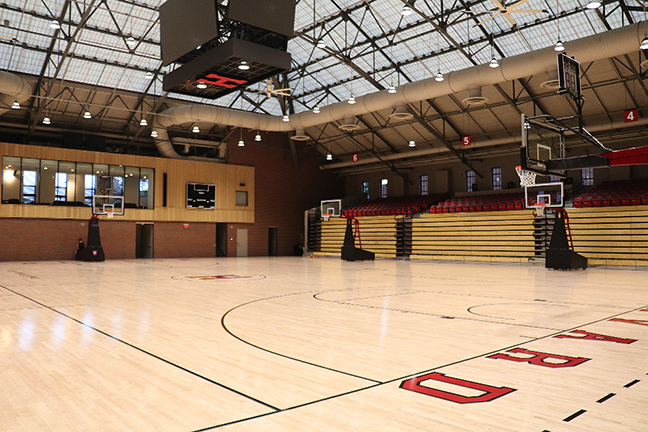 During the next six months, the basketball teams held court where they could: the Business School’s gym, Malkin Athletic Center, even the undersized court at the Law School’s Hemenway Gymnasium. Meanwhile, the coaches moved their offices to trailers, where they squeezed into cramped quarters. The opportunity to do so begins Friday. The men start their season by hosting MIT, and the women tip off against Dayton at a tournament in Maine. The question is whether the team-rebuilding projects will prove as successful as the arena renovation. The men last won an Ivy title in 2015; the women have not won one since 2008. Among the reasons to be bullish: the team would return seven sophomores, who had formed the nation’s tenth-rated recruiting class in 2016. Four of those players became regular starters for the Crimson as freshmen, and two—Bryce Aiken and Seth Towns—led the team in scoring, averaging 14.5 and 12.3 points per game, respectively. Amaker’s optimism also stemmed from how the Crimson had fallen short. Harvard suffered all of its Ivy losses by four or fewer points. He anticipated that this could teach his young players the “fine line” that separates good teams from champions. He also hoped that the postseason loss to Yale would be motivating, much like the Crimson’s buzzer-beater loss to Princeton in the 2011 Ivy League playoff helped to propel Harvard to a title the following season. Looking at any team’s growth over the years, “You can find those moments when their hearts were broken,” Amaker said. Point guard Bryce Aiken will have to fill that void. He was Ivy League Rookie of the Year last season—and the only male player in conference history other than Chambers to be named first-team all-conference as a freshman. In his debut season, Aiken excelled as a scorer, often crossing over defenders to get to the basket and using creative dribbling on the perimeter to free his jump shot. During the Ivy tournament semifinals, he scored a career-high 28 points (20 in the second half) to spur the Crimson comeback. Amaker said the most important priority for Aiken is to do more to “make others better” while not sacrificing his dynamic scoring. This is a priority because Chambers was tied for fifteenth in the country with 5.9 assists per game, and Amaker’s most successful teams have had balanced attacks. The good news for the Crimson is that the team has a wealth of scoring threats. Chief among them is Towns, a six-foot-seven forward who can score from the outside and take the ball to the hoop. Junior Corey Johnson, the team’s best three-point shooter, will help to stretch the floor, as will Justin Bassey ’20, another strong shooter who played more than any Harvard player last year other than Aiken and Chambers (27.4 minutes per game). Finally, Chris Lewis ’20 will anchor the team’s frontline, hoping to build on a freshman campaign during which he led the conference in field-goal percentage (65.2 percent). On defense, the priority is replacing rim protector Zena Edosomwan ’17, last year’s team leader in rebounding and blocks. That responsibility will fall to Lewis and frontcourt teammates Henry Welsh ’20, Robert Baker ’20, Weisner Perez ’19, and captain Chris Egi ’18. The Crimson has also added a powerful perimeter defender in freshman Mario Haskett, who, along with Bassey, is likely to guard opponents’ best offensive threats. Harvard faces several talented opponents. In non-conference action, they play three teams ranked in the pre-season top 25, led by Kentucky, a perennial power ranked in the top five of both pre-season national polls. In the Ivy League, Amaker’s squad will be the team to beat: they were picked first in the pre-season media poll but only by a few votes. In second place is Yale, which returns senior Makai Mason, the star of the Bulldogs’ 2016 NCAA tournament team, who missed last year with a foot injury. The Crimson will also contend with Princeton, last year’s regular-season and conference-tournament champion, who are projected to finish third this year and also return a talented core. After losing its opener at Minnesota, the Crimson—which started two freshmen last year and had one of the youngest teams in the country—reeled off 16 straight wins, equaling the longest streak in program history. Then, they sputtered, losing six of their last 10 regular-season contests before getting blown out by Princeton 68-47 in the Ivy League tournament semifinals. Harvard regained some momentum with a 69-56 win over New Hampshire in the opening round of the WNIT, before falling to St. John’s in round two. The silver lining is that the Crimson is returning a far more experienced core. 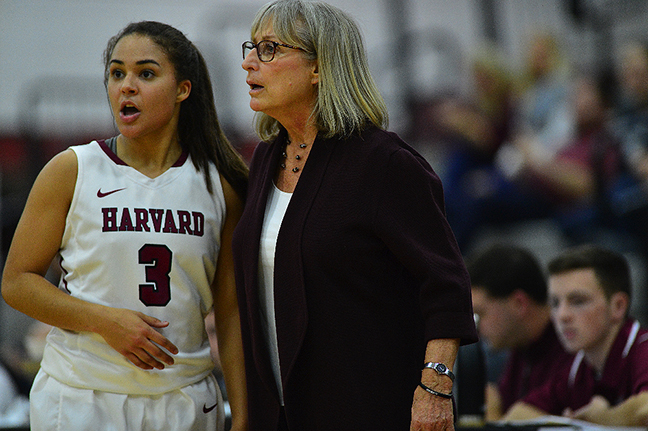 Harvard’s only significant graduation loss was All-Ivy forward Destiny Nunley ’17. Otherwise, the team returns four starters: point guard Katie Benzan ’20, a first team All-Ivy selection last year; Boehm, who played for the U.S.’s U19 team at this summer’s International Basketball Federation (FIBA) World Cup; and co-captains Kirby Porter ’18 and Madeline Raster ’19. Paired with key reserves Sydney Skinner ’19, Nani Redford ’19, and Taylor Rooks ’18, the Crimson has a wealth of veterans. The freshman class adds another attribute: height. During the past five years, the program has struggled with career-ending injuries to post players, forcing Delaney-Smith to shift talented guards like Shilpa Tummala ’16 to the frontcourt. This year, Harvard has six players on its roster who stand six feet or taller, led by Boehm (six-foot-three) and a trio of freshmen: Grace Tworek; Rachel Levy; and Maddie Stuhlreyer, who at six-foot-five, is one of the tallest players in the conference. Opposing teams will no longer enjoy regular mismatches against Harvard’s frontline, and the Crimson can mount a more balanced offensive attack. During the summer, the team shared readings, images, and TED Talks and other videos that illuminated the concepts. Benzan unearthed an article about “Ubuntu,” a Bantu term meaning “humanity” that grew popular in local basketball circles when the 2008 Boston Celtics’ NBA Championship team embraced the idea. The goal of the exercises, Delaney-Smith explained, was to spend July and August instilling in the team the intangibles that would lead to more consistent and tenacious play in February and March. As fall practice got underway, the coach began tweaking the Crimson’s on-court tactics. To take advantage of her team’s experience and athleticism, she intends to play faster this year, looking to score in the first eight seconds of the shot clock whenever possible, before settling into more traditional sets. On defense, the Crimson will use its frontcourt depth to bolster the backline of its zone defense. Will it be enough? An early barometer will be non-conference matchups with three 2017 NCAA Tournament participants: Dayton, Temple, and Florida Gulf Coast. Those games will set the stage for conference play, in which the Crimson—picked to finish third in the pre-season poll—will look to overtake Penn and Princeton, who were picked to finish first and second and have combined to win the last seven conference championships.